Riders are like the additional topping on your pizza, which offers you an additional flavor and taste at the minimal cost. Life is unpredictable and involves a risk due to an untimely death, disease or an accident. When extreme exigencies like sudden death, disease or an accident come unannounced, it brings along a lot of emotional and financial trauma to an individual and his/her family. Especially, if the victim is the income earner of the family, the occurrence of any such exigencies creates an enormous financial vacuum in the lives of the dependents. Thus, it becomes imperative to have a contingency plan in place to combat the financial impact of untimely or sudden death, disease, accident or disability. Term Plan is the most affordable form of life insurance, which offers your beneficiary a lump sum amount as Sum Assured in the event of death during the policy term. Term plan safeguards your dependant against the risk of your untimely death and its financial consequences. Now, to have a robust and enhanced coverage against other perils like accidental death, disability, disease - the best combination is to have a pure risk protection life insurance plan in the form of a Term Plan and opt for additional benefits (known as riders) with the base plan. Riders are like the additional topping on your pizza, which offers you an additional flavor and taste at the minimal cost. Same way, riders offer you an additional coverage over and above the coverage offered under your life insurance plan at an affordable rider premium cost. These 3 riders along with your base life insurance plan will offer you a full proof contingency plan in place. Accidental death & disability rider offers an additional sum insured in case of an accidental death or disability of the life insured. This rider is available at a nominal cost which offers additional coverage over and above the base sum insured for death/disability due to an unfortunate accident. A disability may include temporary or/and permanent accidental disability. This rider is often beneficial for people taking life insurance at younger ages as the risk of dying due to an illness or ill health is lesser at younger age span whereas the probability of an accidental death/disability may be more. With growing traffic on roads, long distance travel to reach workplace and increasing incidents of road accidents due to negligence, buying an additional coverage in the form of an accidental death & disability rider is prudent. 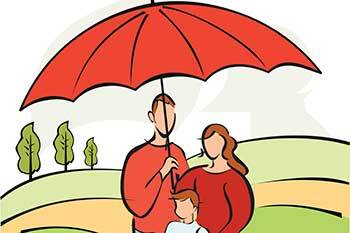 Accidental death benefit premium cost is not related to the age which is otherwise the base criteria for deciding the premium for a life insurance policy. Minimum sum assured range for accidental death & disability benefit rider begins from Rs 25,000 and maximum may go up to Rs 1 crore subject to the maximum sum assured under the base plan. The coverage and premium rates may differ from insurer to insurer. The premium costing for Accidental Death & Disability Benefit Rider may cost you Rs 60 to Rs 70 per ‘1000 sum assured approximately. The rider benefit ceases on the life assured attaining a particular specified age mentioned in the policy contract or on the completion of the policy contract. Example: Mr. Roy has opted for a Term insurance policy of Rs 50 Lakh and has taken an additional accidental death & disability benefit rider for Rs 20 Lakhs. • Scenario 1: In case Mr. Roy dies a normal death during the policy term, his nominee is entitled to Rs 50 Lakh of death claim, and no accidental rider benefit is applicable under this scenario. • Scenario 2: In case Mr. Roy dies in a road accident during the policy term, his nominee is entitled to get Rs 50 lakh as a death claim plus Rs 20 lakh as an accidental rider claim under this scenario. The total payout by the insurance company is Rs 70 Lakh to Mr. Roy’s nominee. Treatment of Critical Illnesses like By Pass surgery, heart transplant, cancer may cost from Rs 1 Lakh to Rs 4 Lakh. Such hefty treatment costs will give the patient and his family a financial and emotional blow. The critical illness rider offers a lump sum pay out subject to the sum insured opted under the Critical Illness rider. The benefit is payable in case, the life assured is diagnosed with any of the listed critical illnesses under the rider coverage. The lump sum benefit helps to combat the treatment expenses, loss of regular income, and other allied expenses. The rider is available as an additional benefit at a nominal cost to battle the treatment cost of the diagnosed critical illness during the policy term. The rider ceases once the claim is paid for the diagnosed critical illness by the insurer. Critical Illness rider is comparatively more cost efficient as compared to buying a stand alone Critical Illness Plan. However, the number of disease covered under a rider and a stand-alone plan may vary. The rider sum insured may begin with Rs 25,000 and can go up to match the base policy sum assured subject to the risk assessment in an applicant’s life and other related policy terms and conditions. Example: Mr. Roy has opted for a Term insurance policy of Rs 50 Lakhs and has taken an additional Critical Illness rider for Rs 15 Lakhs. If, Mr. Roy is being diagnosed with any of the critical illnesses (specified in his policy conditions), the insurer will pay a lump sum rider benefit of Rs 15 Lakh to him, and the critical illness benefit ceases thereafter. However, the base term insurance policy continues till the remaining policy term. The waiver of future premiums continues till the remaining policy term or till the insured attains the specified age as mentioned in the policy contract or till the occurrence of an insured event under the base life insurance policy (whichever is earlier). There is no monetary payout given to the policyholder under this rider. Riders offer enhanced coverage at an affordable premium price. However, it certainly raises the total premium cost. Thus, it is advisable to analyze your rider requirement and choose the ones as per your own case. The author, Harjot Singh Narula is the Founder & CEO of ComparePolicy.